Betty's found a little dough left over from her last post and has fashioned it into a little cookie of a story and then a couple of discussion points we can linger over as we digest and get ready for the weekend. About six months ago, we were waiting for Sonny Boy to finish up his shopping at the mall, so GOSB (Girlfriend of Sonny Boy) and I were waiting in the car with HOB, talking, enjoying the breezes through the open windows. Then GOSB said, "What's that noise?" I heard the scratching too. It seemed to be coming from above us on the roof. "What is going on?" I said, thinking that small branches were skittering around on the top of the car even there there was very little wind. We looked up at HOB who was silent, eating nuts, playing it cool. I listened some more. Then it dawned on me. "Are you putting nuts on the top of my car for the seagulls?" HOB just sat, chewing, a faint smile playing on his face. Notice I said we were in my car, not his. In my last post I noted that we had nicknames for people on our street. We nickname neighbors we don't know either. There was "mustang guy's house" until they moved...."Hillbilly" and then "brother & sister" because it's a couple and they look like they're brother and sister. Also in my last post I alluded to HOB's facial reaction to my questioning. It's a look he's polished over the years. When I ask about something that he does not want to discuss, he loves to give me a look that indicates complete confusion. Not only that, but it is a look that indicates that he is completely sane and composed and I am the insane nut job who is asking the questions. Then comes the slow repeating of the question I just asked. I KNOW the man is just trying to get away from the original issue, is just buying time, AND is messing with my psyche, trying to get me to doubt my own sanity. Betty (sweetly): Did you take the clothes out of the dryer before they were dry? HOB (slightly confused look combined with contrived innocence): What? What are you saying? Betty (clearly and distinctly): These clothes smell funny, Did you take them out of the dryer before they were dry? HOB (the SUPER confused look now and a tone of irritation, as though he is trying to decipher a foreign language): Clothes? Dryer? What is it you want to know? Did I take the clothes out from where? Betty (patiently and sweetly, not a twinge of sarcasm) : I had clothes in the dryer and now they aren't there and these smell funny. HOB (now getting into the nitpicking so as to avoid larger, vital laundry issue): So you are smelling your clothes and you want to know what? It goes on from there. It won't work. It won't. It won't. SO here's my question to you: Does your significant other have a habit like this, designed to make you crazy? Does he/she have a signature avoidance technique? Tell Betty all about it! You'll feel better and so will I. You know, I would totally comment, but you said to keep it G rated. Or wait, did you say Grated and I just read it wrong? HAHAHA, oh gosh, too funny! HOB, Betty is being nice. ANSWER the question! Feeding the seagulls on the roof of your car!!!! CLASSIC!!!!! LOL!!!! He is such a master of the art of talking in circles! I have named my neighbors before, yes indeedy. We have Black Jeans McGee, The Anals, and Old Lady Shorty Shorts. I only have one neighbor on this road but I call them the pyromaniacs because they are always burning stuff. They love to set their ditch (that is right across the road from our place) on fire after the tall grass dies in the fall and just take off and leave it to burn unsupervised. Betty being a lover of dr. Suess, I have names for everyone under the sun. However, I am ashamed to admit many are not politically correct or G-rated. So, unfortunately I don't think I can share!!! As far as my husband and avoidance...well tim has many "typical"things that he does that can (depending on my mood) drive me crazy. But he is pretty assertive...so avoidance is not one of them. Hmmm...I think I may be more like your husband in that regard. That picture is disturbing. 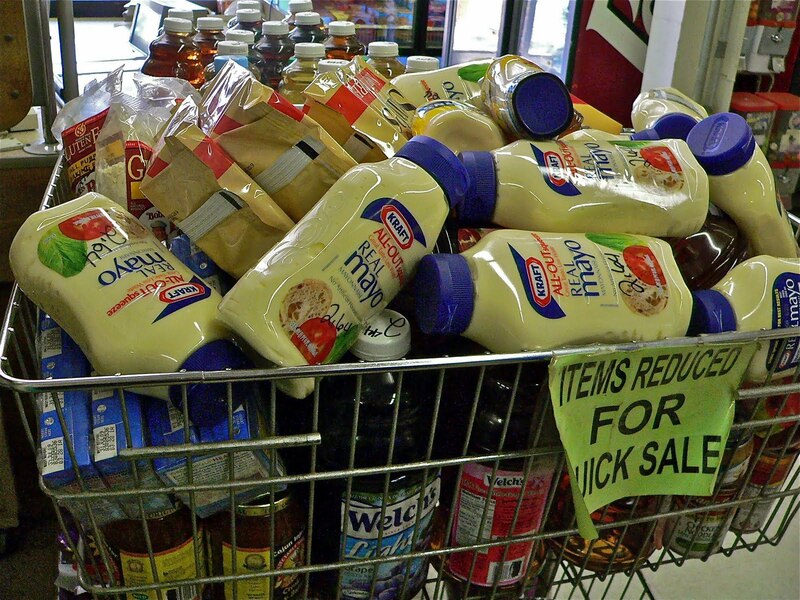 Who buys mayo that's been reduced for quick sale? Eew. Fun fun fun.we have a "diamond" too, but i'll call her "pickles" instead so I don't sound so bad to the kids. Makes me wonder what my neighbors are calling me! I can't wait to see HOB's rebuttal to this post. What's he got to say for himself? Thank goodness I have no significant other. You always cheer me, Betty. We don't have nicknames for our neighbors...maybe I am missing out here? My hubby is constantly losing things and it drives me crazy. Mostly because he says I move them and so it is my fault. I didn't even see the danged thing!! Sigh! Ooooh I never thought to make up names for my neighbours apart from neighbour next door, neighbour next door but one to the left, one to the right, two doors down neighbour! LOL!!! My ex-significant other used to drive me mad by pretending to listen to me when I knew he wasn't. He'd agree and nod but his eyes were glassy and had that far far far away look! We do have nicknames for our neighbors too, we have zoom zoom because he loves the sound of any small engine running full blast and we have slam-slam, he must open and close his car doors at least 60 times each night. Hey, I liked how HOB didn't really answer your question, what office is he running for? We only have one neighbour with a nickname. That would be the old Italian lady next door - sometimes extended to the old Italian lady next door who is looking for her cat in our backyard! Oh, I have names for my neighbors. The girl next door, well, you will have to guess how I refer to her. The guy next door is just plain odd, and his antics are too R-rated to post in a blog. Unfortunately, the wall between my unit and his is obviously non-weight bearing. However, I will say that the neighbors keep to themselves and that for me makes for the best kind of neighbor! On the short list of things to NEVER buy on sale - mayonaise. Ew. The love of my life is 16 years older than me. Let's just say, by most peoples' definition, he'd be considered an "Old Fart". Doesn't come anywhere close to looking his age, so this technique is harder for me to embrace. His diversion technique not-so- cleverly employs his inability to hear what I'm saying when I'm 20 ft. from him. 1st attempt at getting a response from him...silence. 2nd attempt: (I ask a little louder)..."Did you say something?" 3rd attempt: (Me-louder still)..."Sorry, the fridge was running and I couldn't hear you." So by the 4th attempt I get my question/statement to reach the other set of ears in the house. (Forget about the dog hearing it. He's 15 and doesn't hear when I walk in the room). Neighbor nicknames: "McGillicuddy" for the one who just won't shut up and won't take the hint that someone's gotta go!! I have no idea how I came up with that name. My wife's usually the one to play the 'act innocent' game in our house! LOL! True story...we've always had nicknames for our neighbors. This dates back to when I was a little girl. Mom called the guy who lived next door, DimWit. My youngest sister, about 4 at the time, sweetly hollered out a "Good Morning, Mr. DimWit!" one summer day. You'd think we'd learned our lesson, but alas, we still give the neighbors nicknames...Gooberheads up the Street, DingDong down the way, and always a favorite...Idiots behind us. :o) Happy Friday! HOB loves him some birds doesn't he!!! Maybe you should rent Alfred Hitchcock's 'The Birds' this weekend. We used to have nicknames for neighbours. At our last place there was, #3 (he lived in apartment #3, we're clever) and ponytail guy. Now, we have someone below and someone above. The woman above is named Candice but we kept forgetting her name so she's now known as Clarice. Hey I order more bread when at a restruant near the ocean, and take it to the gulls.Names: Crazy Barbara-she lives by herself and talks nonstop,Commander in Chief-Her word is final and always right,plus she likes this name,and a cat whose name changes with what it has done wrong, Nuisance now.Sounds like our lives are fairly similar.You might add WFBS on your husbands initials for Who Feeds Birds Secretly. A friend, Big Joan, enjoys naming people when we go out, like a principal with tattoos, Blue Arm. "Peppermint Patty, Charlie Brown, and Pig Pen." The husband and wife look like those two and their kid is always dirty. About the mister...don't even get me started. He pleads "ignorant" all the time. It drives me crazy!!! "I don't know what you're talking about." "I don't remember." By the way, I have the same issue with him and the dryer. I am constantly yelling at him because whenever he puts in a load he always dries it on the "timed dry" setting. It never dries the clothes completely (He thinks he's saving on the gas bill.). Same argument over and over. I'm telling you, my life is like TiVo. When old neighbors move out of their house, everyone still refers to that house as "Bob and Sue's house". Years later, no matter who is actually living there, it will still be referred to as "Bob and Sue's house". PS...regarding the second part of your question...I don't actually HAVE any quirks or bad habits that annoy my bride, since I am the perfect man. My husband does not remember names, so he associates people with something. Can't think of an example now that wouldn't take forever to explain. Wow, HOB really does have a bird thing, eh? I'm telling ya, I bet there is a help group. We do have names for neighbors. In fact there is a whole cover of people who are frowned upon, and one name that categorizes them all. I thought all spouses were wired for complete avoidance techniques related to all thing household. Like: inability to see pile of laundry that needs folding. Inability to smell dirty dishes that need cleaning in the sink. Inability to sense piles of mail that needs to be sorted. Etc, etc. It's a gene, right? That they all have? My neighbors call the one I refer to as Big D-Bag, Mr. Muscles or Muscle Man. That's as good as it gets in the present neighborhood. My husband has been laughing at everything I say this week. Me: "I put my grow light on a timer for the plants so I don't have to remember to go down there and turn it off anymore." Husband: Laughs as though he just heard a really funny knock knock joke. Husband: Laughs as though it's funny I'm hoping to smother him with a pillow after he falls asleep. Living in London, I don't know any of my neighbours (yeah, sad, I know). It's just like that here. But we do have one bloke next to us who seems to pop up in unexpected places. We call him Waldo. On the other hand, the two dogs directly across the street from us, who spent the majority of their time in the yard barking at everything that moved, I dubbed Joe and Sparky Barky, despite the fact that I normally am horrible at choosing pet names. On our recent trip to the mountains, we were waylaid on a back road by a car-chasing canine, and I mused to Miss Chef, "I wonder if he's a Barky, too?" LOL! To discussion item #1: We have several - Ted, Ted $hit on your head, Stinkface, The Elderly Sterotypers, Guy Who Wears the Same Shirt I Do, Retired Cop-aroo, and Fancy Stuff Folk. I'm sure there's more, but that's all I can think of right now. Him: Did you move my glasses? Me: I don't think you should talk about looking at other people's anatomy that way (making it seem like I heard him say "I like to look at other people's a$$es"). Him: We need to get your ears checked. Me: What did you call me? Feeding the seagulls, oh my, all that bird crap and more to deal with! HOB is definitely a card! We have "Speedo" because for years, he'd wear nothing more than that in the summer. "Biker Dude" revs his Harley whenever he feels like jolting the neighbourhood awake. We have "the thugs." That nickname was solidified the time we saw the police at their place over the summer. My hubby mostly just pretends to suddenly be unable to hear me when I ask a question he doesn't want to answer. Well, because we have a little guy, we are pretty careful to call people by their names, along with Mrs. and Mr., especially with Halloween coming up, because, you can imagine how that might go with a 4-year-old. But. We do have one. We call him Shawwwwnnnn. But not in a nice way. I'm not sure why. He annoys us. HOC (Husband of Chicken)is usually the one calling me out, but he snores. So there. It seems like no matter where we move to we have a neighbor that we call 'The Burbs' after the 80's movie. When we call them that it's meant that they don't keep their property up to the standards of the rest of the neighborhood. We also have the cat lady, crazy gun lady, lawn mower man. When we first moved into this house 26 years ago, a neighbor had a dog who "shopped" the neighborhood garbage bags each Thursday. The dog has been known as the "D--- Trash Dog" ever since. Not thinking HOB is going to be digging this post. Ohhhh, yes! My hubs does the very same thing and tries to make me look like the crazy one! We live in the country now, but before this house we lived in a neighborhood with some interesting characters indeed. Next door, we had Tom, the neighbor who would walk out of his house the second he saw signs of life at our house. He would pretend to wash his car constantly as he watched us. He would also say semi racy things to me all the time that drove me crazy. My hubs called him, Mrs. Kravitz. I called him Perv Car Wash Man. The couple next door were our friends. They were so beautiful, we called them Ken and Barbie and yes, we called them that to their face. The woman across the street loved to sit in her front yard and drink herself some cocktails, every single night for hours, we called her Lush Laurie. And then of course, there was the mom down the street who let loose at a neighborhood party one time. She came up to my husband and announced she liked to do this one impulsive thing when she liked someone and then she proceeded to lick the side of his face from the top to the bottom.She was forever known as The Licker. No good nicknames, unfortunately. There was a house we used to call "the trailer park," but it got sold and the new owners cleaned it up. WHAT?!? He's eating two lunches? Um, you told me that. No I didn't. I'd remember that. Oh. Yeah, I guess I do remember telling you that. I could go on forever. Why did you paint the front door green? Because I brought color strips back from the paint store and that's the color we picked? Ham and beans? Do I like this? Oh yeah, we have nicknames for the neighbors (doesn't everyone?). One neighbor is the Lawnmower Guy - because that's all he does all the time is mow his grass. The other neighbor - well..... you did ask that I keep it G-rated so I won't even go there. Ha ha! I don't know what's funnier - reading your post or the comments! You could live a life like me, constantly on the move, so if you don't like your neighbor, you just pack up and leave! But when we are in AZ, we stay for 5-6 months. We have the same neighbors. I guess we would call the one guy "Jitters" because he drinks coffee non-stop and chain smokes. The guy next to him is "Bob the Builder" because he's always tinkering with something! My husband has me repeat everything even though I know full well he can hear me. I want to smack him sometimes! Well I mentioned the one house I've recently named in this neighborhood. There is a sort of theme I've just noticed about my last two residences. Prior to that Corey and I lived with my mom for two years. In her neighborhood is The Crazy Family House. All freaking nuts, from the grandmother down to the youngest grandchild (who was three at the time). It seems like they've settled down in the past three or four years, but we know what's lurking just below the surface, buahahaha. As for Tom, yes, he does have his "tricks." There are a few of them. However, it's late and my brain power has gone to other things (probably just as well not to focus on that stuff anyway, right *ohm*). I'm not going to comment on nicknames for neighbors because my neighbors may be reading this. Oh yes! We DO have names for everyone on the block too! For the most part, they are nice, but if I use their real names, Joe can't remember who is who--I've got to use their nicknames. My favorite is the guy on the corner--he's always messing with power tools and one of these days, he's gonna take off a limb, I swear. We call him "Stavy" from the movie "The Ringer". He was a guy who cut off his fingers. We do have one up the street known as "The Goat Mans House" not sure what his name is but this is what his house is called. Now I am worried about nicknames the neighbors have for us. Yikes! My fiancee always asks a question instead of answering mine. She will avoid my question and bounce it back at me. Very irritating. This is terrible, but I'll tell you anyway. Before we had kids there was a family at our church: mom, dad, 2 kids. The kids were like 4 and 6, with thick, wavy, dark hair. The parents always dressed like they had just stepped away from their jobs at a bank, but the kids always, always had bed-head. I'm not talking a little, either. Trying not to be mean (while laughing at them) we reasoned that they must have lost their brush. Since we didn't know their names, to this day, we will refer to that family as the Brush family. Gosh, I feel guilty just writing that, but it was SOOO funny at the time! Grey Skies Are Gonna Clear Up--Right? A Monday Morning Flower Just For You!